Ever since Heather and I got on the paleo bandwagon, my mom has been curiously intrigued. I have my mom to thank for turning me on to cooking from an early age, and she’s been enjoying our recipes and making suggestions. This is a take on a soup that she cooked for herself just after Christmas, and as we love mushroom soup as well, decided to give it a try. It turned out really well, so we wanted to share the love. We’re finally getting the cold winter weather here in the mid-Atlantic, so warm soups really hit the spot after coming in from work or errands. 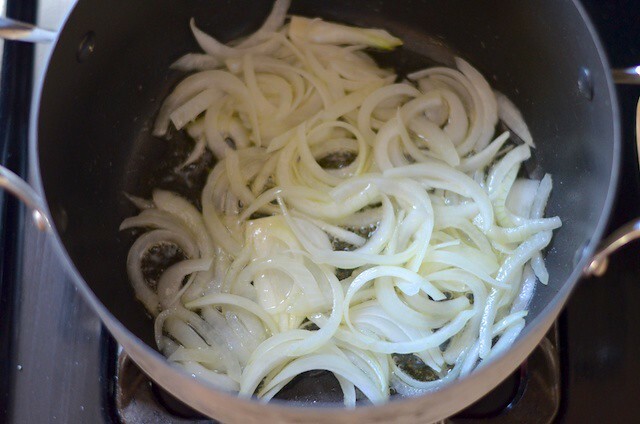 Melt 2 Tbsp of ghee in medium stock pot and then add sliced onions to lightly caramelize. Simmer on medium approximately 5 minutes, stirring frequently, and then turn to low for an additional 3-5 minutes. 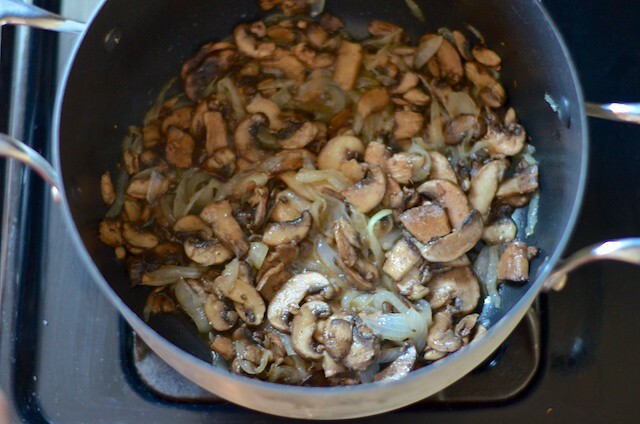 Add sliced mushrooms and coat in ghee/onion mixture. 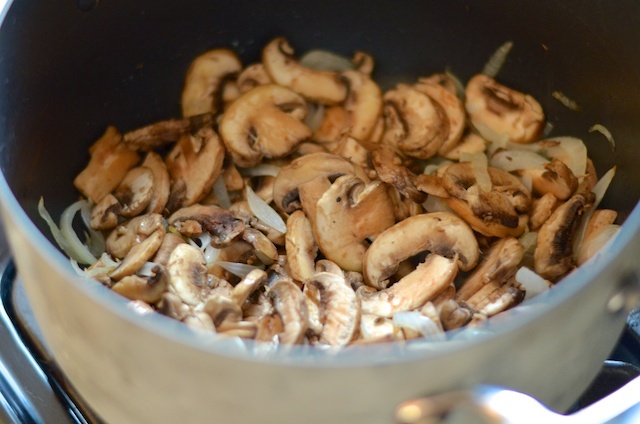 Add in additional Tbsp of ghee and cook mushrooms for another 4-5 minutes on low. Add beef broth and bring to a simmer for 5 minutes. 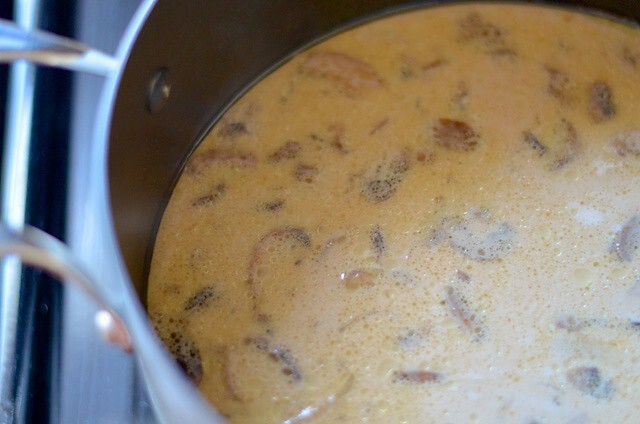 Pour coconut milk while stirring and simmer an additional 2-3 minutes. Add pepper to the soup, and serve. And, as always, feel free to join us on Facebook and twitter for all the latest we’ve got in store. Enjoy! Just saw this recipe on Chowstalker! It looks perfect for cold winter nights (and it’s cold in NYC right now!). Thanks! It has definitely helped now that we’re experiencing actual winter weather on the east coast. I grew up just outside of NYC, so I feel your pain–it is a little warmer down here in DC. What kind of coconut milk do you use? I usually get Golden Star and it is entirely too thick in comparison to the coconut milk you use to have soup that looks like that. Golden Star as more of a sour cream consistency. We often use this coconut milk, but also have used the Whole Foods brand, 365 Everyday Organic. When our coconut milk comes out in a kind of sour cream consistency, we’ve found shaking it before opening helps that consistency. Conversely, putting the can in the refrigerator beforehand can be great if you want to make a dip or spread with it for your favorite veggies. How “coconutty” does it taste? Or do the other flavors mask the coconut? I wouldn’t say it is too strong with the coconut; there’s a sweetness from the coconut, but the other flavors are more prominent. Let me know if you give it a shot! Just made this two nights ago and it was SO great! Cannot wait to try this again, even my boyfriend who doesnt really like mushrooms thought it was good and had a large bowl of it. Tried it and it was amazing with the vegetable broth! ohhhh. yum! This looks so tasty. I will definitely be making it in the near future! would it be possible to substitue butter for the ghee? thank you, i’m very excited!! i also don’t have full fat coconut milk, but i think that’ll be ok!! i’ll let you know how it turns out!! This soup is FANTASTIC! I make it at least once a week. Yum yum yum!! Looks amazing! Does this reheat well? Looks good. Can I freeze the extra? 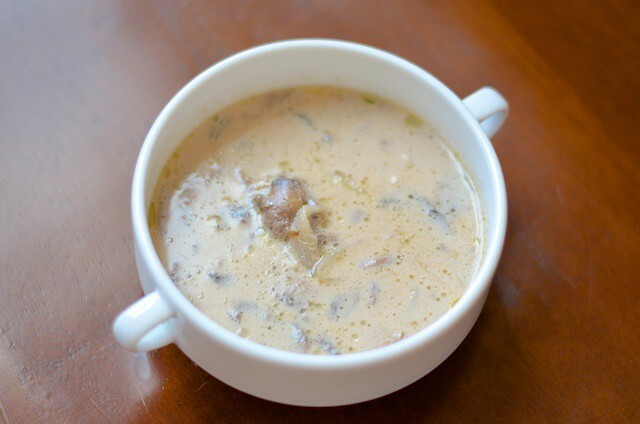 I adore mushrooms and have been thinking of looking for a Mushroom Soup recipe (Whole 30/Paleo-adaptable). I just saw this on your Celery Soup link and looking at the pictures, my mouth is watering. I will def. make this and get back to you. Have to eat out my freezer a bit first. Wish the internet had cooking smells!